U.S. President Barack Obama shakes hands with members of the crowd after speaking Tuesday at the Amazon Sorting Facility in Chattanooga, Tenn. POLL: Were you impressed by the president's speech? The president came. The president went. It was just a three-hour visit, but it shut down an interstate, closed a million-square-foot factory, incited protesters and aroused the blue voices in a red state. It was ordered chaos. There were thousands who waited for hours to get a peek at the president. But the show rarely abandoned its script. The day started long before Air Force One landed, and the buzz will rattle Chattanooga until the next president finds his way to the Scenic City, whenever that may be. Here is a multi-view look at the fast-paced day. A line of Amazon employees begins to stretch through the parking lot of the giant building at Enterprise South. Some are wearing red, white and blue garb; a few are in their Sunday best, with heels or sports coats. Most are in sneakers, jeans and T-shirts. They have a paid morning off. The roundabout outside of Amazon begins to fill with supporters from across the region: Knoxville, Monteagle, Tenn., Dalton, Ga., Athens, Tenn., and Atlanta. The mood feels like a block party or a tailgate. Children dance and older men and women sit under umbrellas with posters scrawled with slogans like "We Support You Mr. President," "We Love Obamacare" and "See Barack City." On one side of the driveway up to Amazon stands one group holding quilts of fabric printed with the president's face. They were sewn by Clairee Jones, who traveled from Atlanta back to her hometown for the occasion. A young brother and sister stand proudly with a cardboard cutout of the president. Another man waves an Obama flag. "We were so very excited when we found out he was coming," says Peggy Wall, a member of the McMinn County Democratic Women's Club. "We were shocked!" adds Trina Jackson. "Why would he come to Tennessee? It's so red!" Under one tent, a group of parents has slathered sunscreen on their kids and settled in for the day. "I'm an Obama supporter. My husband is not. But even he said that this was a really important thing for our kids to see," says Sarah Steffner. "I would have taken them out of school," insists Andrea Odle. "This is what they will remember. Instead of learning about history in a book, they are getting to see it up close." Karen Haywood and her family set up lawn chairs at the Regions Bank branch on Lee Highway hoping to see the motorcade pass by. They figured it was a good spot after seeing the K-9 unit sniffing around the area, though no one knows his route beforehand. Just down the road at the Chattanooga Airport, protesters and supporters alike gather to greet the president. "I think he came to the wrong place," said Kevin Baigert, of Sumner County. Summer Hammock couldn't believe how close they were able to get to the presidential motorcade. "I was glad for him to see that people aren't happy with his actions," she said. Air Force One lands. About five minutes later, after White House staff and security and the press corps have exited, Obama jogs down the stairs to a two-man welcoming party. He shakes Democratic U.S. Rep. Jim Cooper's hand, then he shakes Chattanooga Mayor Andy Berke's hand. On a platform about 170 feet away, 21 TV reporters, cameramen and photographers track the three men. But not for long. No more than 30 seconds after Obama's feet hit the ground, he hops in a car. Berke and Cooper follow him. Obama's car takes off, and so does the rest of the motorcade, about 20 Suburbans, police cruisers and white vans, filing out of the airport and onto Lee Highway. Crowds wind through the mammoth aisles of Amazon. The line is fenced in. Then the group is herded into a pen before the stage. Some employees stand on the catwalks behind the stage. They line the bleachers behind the podium. Security is tight. People are allowed to bring one person with them who is not an Amazon employee. Some people bring friends. Some bring children or spouses. Charlie Loomis, who was invited because he is catering for a group after the event, holds his 10-year-old son on his shoulders. The boy, stretching up to see, waves a small American flag. Loomis remembers when his dad took him to see President Ronald Reagan. "Just being able to go see the president speak 20 feet in front of you is a once-in-a-lifetime experience," he said. Employees are warned not to talk to the media. Spokespeople for Amazon rove about keeping an eye on the press. The growing crowd waits nervously, folding their arms, picking at their nails, raising on their tippy toes to see action in the foreground. People yell when the seal of the president is unveiled on the podium where he will speak. Heading north on Interstate 75 past Hamilton Place mall, the motorcade cruises down the empty highway. As it does, the southbound lanes are clogged. Cars and SUVs and semis are parked, waiting for the president to ride by. People sit atop their own cars. Arms and hands and cellphones stretch toward the opposite lanes, and pictures are snapped of vehicles with black-tinted windows speeding by. Obama and the rest of the motorcade arrive at the Amazon Fulfillment Center. They end up driving from a back road far from the roundabout where the largest group of supporters gathered - which means only a few people with signs cheer the president as he pulls in. That includes a group of young women who squeal and clap their hands. "He waved! I swear I saw him inside, he waved!" says Rada Giurgiu, who is from Romania. "I can't believe it. He was that close!" Away from Obama, the crowd of more than 2,000 erupts in cheers when a shift manager named Sarah hits the high note in the Star Spangled Banner. Amanda Waddell of Greeneville, Tenn., stands with her two children, Brandon, 14 and Emma, 7, in the sun-beaten Amazon parking lot as the last of the employees file in. They have been up since 5 a.m. to come see if they can glimpse the president. They each hold a sign to spell out the phrase: "Obama Does Care." The family strikes up a conversation with Tennessee Democratic Party Chairman Roy Herron, who tells them he will do his best to help them get inside to see the president. At the plant entrance, he flashes his tickets, and the excited family is ushered into the crowd. "This is amazing," Waddell says. "We were just hoping to see his car. But to be inside is just incredible." Brandon and Emma crane their necks to see over all of the adults. "What if I can't see?" Emma worries. "I'll hold you on my shoulders," her mother says. Obama arrives on the floor at Amazon and greets Sarah Richey, an employee whose job is to package orders. "Tell me how this works," Obama says as he approaches Richey's station, his tie off but his wide, TV-ready smile on. Richey explains the process of fulfilling orders. One station behind Richey's, Monica Disnuke cranes her neck. Bright lights shined on three stations, the stations where Obama would stop to greet and chat with workers. In between, at unlit stations like Disnuke's, employees would package orders of protein powder, Crest toothpaste and Keenan Farms pistachios. Business as usual. Obama greets Richey and makes small talk. About 20 members of the media watch the conversation, then are ushered to the next station, where the same thing happens. In between, from one station to the next, Obama and Amazon Vice President Dave Clark chat, as if they are not on display for 20 reporters, photographers and cameramen. Obama concludes the tour and heads downstairs, where he will give his speech. "Hail to the Chief" trumpets on the overhead speakers and the president takes the stage to screams. Hundreds of cellphones are raised into the air to capture the moment. Many won't put their phones down until Obama leaves. People stand on chairs and the tips of their toes to get a better glimpse. Secret Service agents had to pull some down off the metal barriers. "Hello Chattanooga," he says. "It's good to be back in Tennessee." The screams are deafening. People cheer when he talks about how more jobs are needed, when he mentions health care reform, immigration reform and a hike in the minimum wage. Long-lensed cameras zoom in to pick up emotion on faces. "Oh. That's me, that's me," an unemployed man yells. A few stand emotionless, their hands in their pockets. The president says Republicans won't support any idea to improve the economy that comes from the Oval Office. "Or show up for your speech," one man yells, referring to the notable absence of some conservative lawmakers. Present Republicans like County Commission Chairman Larry Henry stand stoic. Little clapping. National reporters stare at their laptop screens, clicking away. Obama finishes his speech and walks around the bottom of the stage. Secret Service agents circle him. People pour over the edges of the pen they are standing in. With cellphones they lean over backs and push their neighbors. 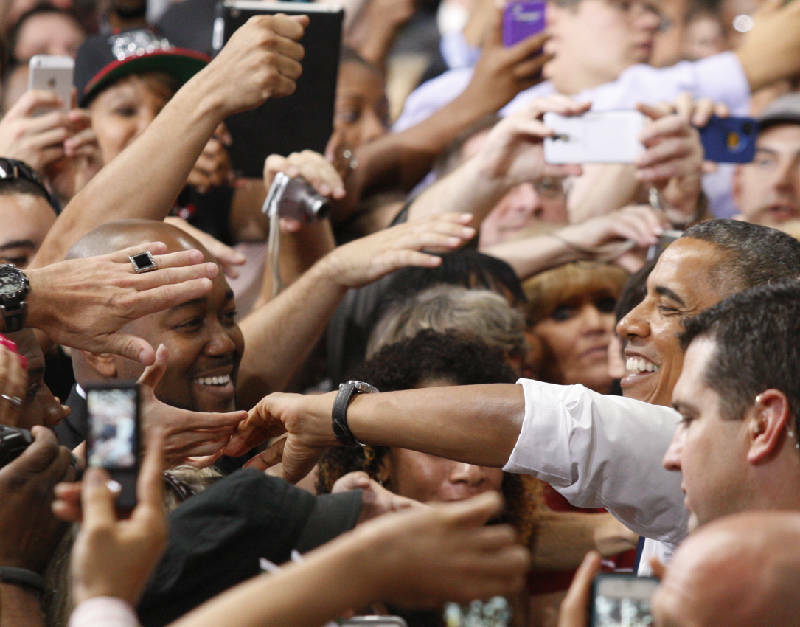 Hands reach as far as they can to touch the president's hand. Robert Mays, a 23-year-old Amazon employee, is one of the few who gets to shake his hand. "It was amazing," he said. "He didn't look as stressed as I thought he would. He was so regal." Another woman who touched him turns to a friend. "I'm shaking," she says. Jason Oxendine, a 26-year-old Amazon employee, came close. It was so tight he said he could hardly breathe. "Some woman pushed me off. I just missed my chance. It isn't ever going to happen again," he says. The crowd dwindles at Amazon. Employees clock back in to work. Supporter Ryan Scofield walks back to his car, glowing after watching the motorcade pull out of Amazon. Scofield - who worked on Obama's campaign - didn't see the president through the tinted windows, but says seeing his car was enough. "Just to know he was right there ... that was exciting enough for me," he says. The motorcade arrives back at the airport. Obama's car parks right next to the stairs to the plane. He hops out and jogs up. At the door, just before walking in, Obama turns around and waves. Then he heads inside, and he's gone. Thirteen minutes later, Air Force One takes off. Staff writer Louie Brogdon contributed to this story.